The Foreign Minister of Iran chided the United States and its allies Friday as hypocrites on Twitter, accusing Washington of "deafening" silence over the alleged beheading of a child by American-backed rebels in Syria. 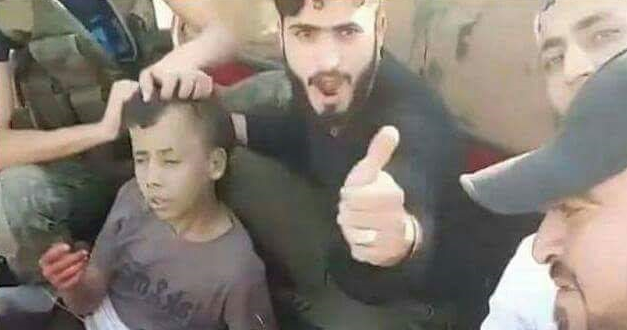 "Apparently western-backed terrorists beheading a 12-year innocent boy in #Syria is the new normal," Javad Zarif said in his English-language tweet. A U.S.-supported Syrian opposition group said Wednesday that it would open an investigation into the beheading by its members of a boy accused of spying, calling it an "individual mistake" that does not represent the overall policies of the group. The Nour el-Din al-Zinki group, that fights the Syrian government and the Islamic State of Iraq and Syria (ISIS) under the umbrella of the U.S.-backed Free Syrian Army, condemned the beheading. The gruesome murder was captured on video and published online, triggering an instant backlash against the group. It is not clear who the boy was or why he was beheaded on camera. He was identified by activists on social media as Mahmoud Issa, a 12-year-old Palestinian. The Syrian government also denounced the "repulsive crime" against an innocent child in a statement to the United Nations, saying the boy was a Palestinian from the Palestinian refugee camp of Handarat on the edge of Aleppo. The incident allegedly occurred in Handarat, near Aleppo, on Tuesday. A young boy is seen on the back of a pickup truck surrounded by armed men who accuse him of being a spy and a member of the Quds Brigade, a pro-government Palestinian militia. He is then beheaded with a knife by one of them. The Quds Brigade, in a statement posted on its Facebook page, strongly denied that Issa was a fighter, adding that the boy was ill. It said he was killed by a "terrorist" who lost his brother in battles near Handarat apparently as revenge. Nour el-Din al-Zinki, in its statement, said it will investigate the incident and expedite punishment. It said everyone involved in the violation was arrested and are being investigated. The group, which operates mainly in Aleppo, has received support in the past from the United States. Amnesty International said the video is the latest "abhorrent signal" that opposition groups are carrying out serious abuses with impunity. "This horrific video showing the beheading of a boy suggests some members of armed groups have truly plumbed the depths of depravity. It is yet another gruesome example of the summary killing of captives, which amounts to a war crime," said Philip Luther, Director of Amnesty International's Middle East and North Africa Program. U.S. Secretary of State John Kerry said he has seen the "appalling report" but could not confirm it happened. "Obviously we're very concerned certainly if it's accurate," he said, adding that if the report is proven it would "give us pause about any assistance or, frankly, any further involvement with this group." Lebanon's Hezbollah group, whose fighters are in Syria fighting alongside President Bashar Assad's forces against the rebels, also pounced on the beheading. In a statement issued in Beirut, it described the beheading as a "disgusting crime" by "so-called moderate rebels backed by the U.S. and Saudi Arabia." Meanwhile, the Red Cross said a lack of access is forcing it to scale back its operations aimed at helping tens of thousands of people, mostly women and children, who need "urgent assistance" near Syria's border with Jordan. The Geneva-based organization decried "international failure" to help refugees and others affected by war. The International Committee for the Red Cross said aid agencies have faced difficultly accessing the border area, known as the "berm" for its earthen mounds, after Jordan closed the border following a car bombing last month that killed seven Jordanian soldiers near the Rukban crossing point. ICRC Middle East regional director Robert Mardini said, "The crisis at the berm reflects an international failure to protect and help people affected by conflict and who are in desperate need."